Target! We all love Tar-jay, and most of all, we love those glorious little red clearance stickers. Frugal shoppers have keen eyes, and we can spot those little suckers at 20 paces. 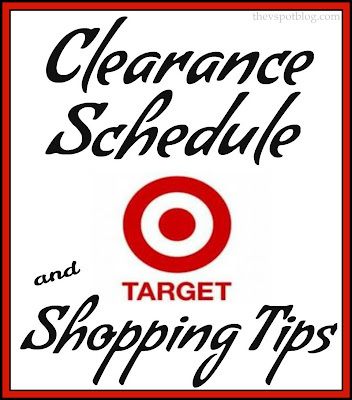 Besides their regular weekly markdowns, twice a year there are two big clearance blow-outs: A Baby Items Clearance in January and July and a Toy Clearance in July and October. Then there are the holidays. The day after a holiday, all holiday merchandise is 50% off. Three days later it drops to 70% off. Three days after that, 90% off. Whatever is left after 2 days goes to Goodwill (who then turns around and ups the price… what’s that about?) I have found that Christmas merchandise doesn’t exactly run on this 3 – 3 – 2 mark down schedule. You just have to keep checking back. Also? I always scan the price. Sometimes it is mis-marked and might be even less than you think. 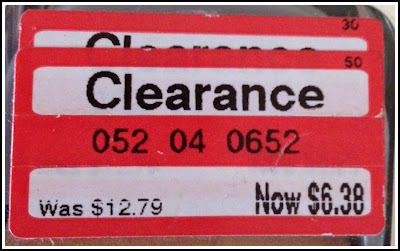 Sometimes it is in the clearance section but is still full price. One other tip. Target’s full prices all end in 9 (as in $3.89… $19.99 etc.) The first and second time it is reduced to clearance the last digit in the price will usually be an 8. Once the last digit in the price is a 4, you can assume there will be no further markdowns, and you should get while the gettins’ good. I could’ve been patient & waited for this to go down again. But I’m not patient. Do you have any Target shopping tips? Brilliant! The ending number tip is so helpful. Might have to take yet another trip to Target today…. I’m a Target perimeter shopper myself. I always look out for furniture display clearances and the home section since those tend to be where I find the biggest savings. Love Target! Great post and love the schedule. Thanks and have a great week! Thank you for the Target tips. I am about 45 minutes away from a Target so I don’t get to drop by as regularly as I would like to. It’s great knowing about the pricing. That is some very useful and helpful advice/info. Aren’t you the smart one to know all that. I don’t get much chance to enjoy Target. We only go into town to do our major shopping on SS payday. By the time we get our groceries at Walmart we’re pooped out and head home. (total bummer). For some reason even when we get into town we have other things to do and I rarely get to Target. I’ll have to make a point of it now. Thanks again for the info. And you have had this information for how long? 🙂 Thanks for sharing. If you look at the top right hand corner of the clearance sticker, the little number shows what percentage it has been marked off of the original price. Shoot, I missed the toy one again this summer! Such good tip about the prices, thanks!! Great post! My best ever clearance find was a $40 dress marked to $3.33!!!!!!!!!! BEST DEAL EVER! Love this post and glad that I now know some inside information. I refuse to pay full price for clothing when I know I can get it for much less! Tip of the day: cutting corn off of the cob. Clean your coffee maker using vinegar. Turn your old washing machine into a fire pit. Shopping for Halloween supplies… in June. A simple tip to clean cloudy looking glasses.